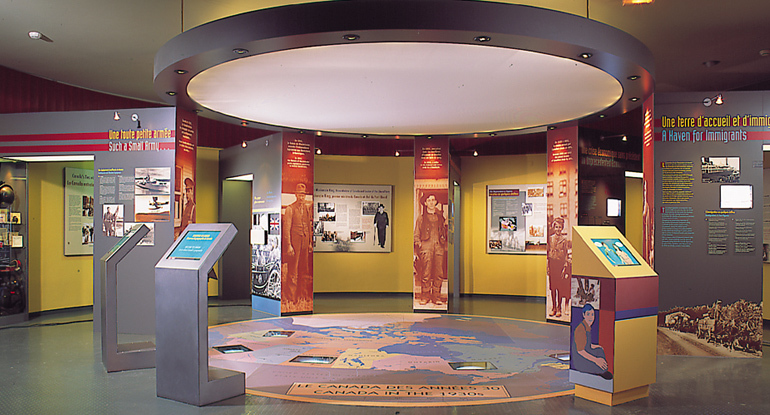 The Juno Beach Centre’s permanent exhibit draws on photographs, documents, firsthand accounts, multimedia, maps, and artefacts to tell the story of the Canadians who volunteered for military service or mobilized at home to contribute to the war effort. It also presents the battles that took Canadian units from Sicily to Italy and from Normandy to the Netherlands. The Centre is not only a museum about the war. It also portrays the personal accounts and real-life stories of the society that these soldiers bequeathed to their children and that now forms Canada. 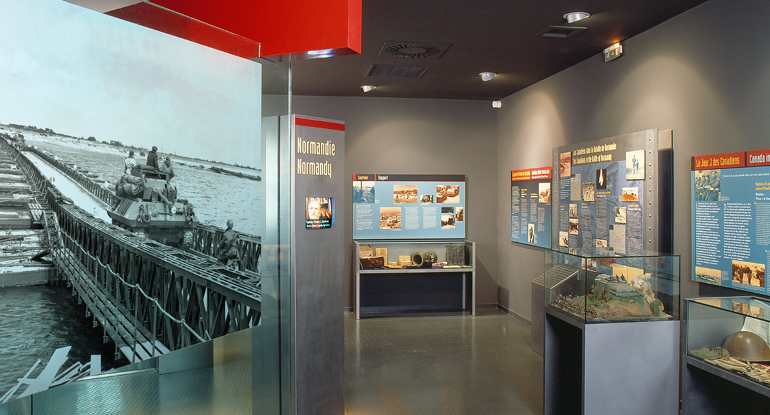 In this first room, visitors stand in a simulated landing craft to watch a film which puts them into the mindset of Canadians during the Second World War. Images of war, training, D-Day, as well as, Canada during the war years are projected on the walls, while Canadian soldiers and their families describe what they were thinking and feeling at the time. 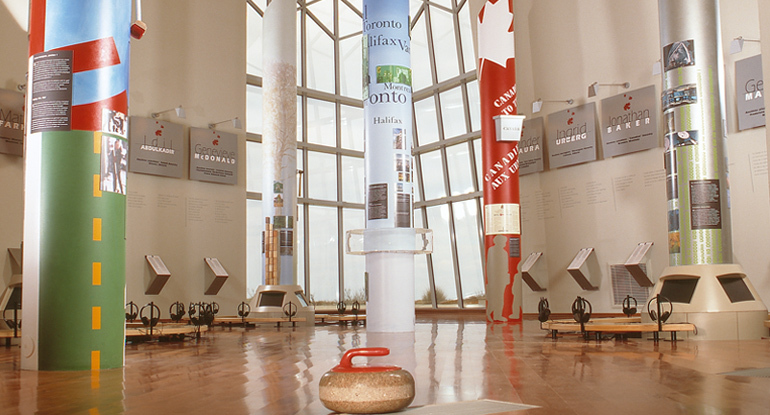 Upon exiting the introduction film, which sets the tone of the permanent exhibit, visitors are given reference points from which to draw an understanding of Canada on the eve of war. The geography, demographics, economic situation, state of the military, politics and the social climate of the time are presented. Young visitors initially ‘meet’ Peter & Madeleine via a terminal located in the main hall. In this circular room and throughout the permanent exhibit, the “young public” circuit is presented through the eyes of these two young ‘virtual’ Canadians of the 1930-40s. This room, comprised of two areas, follows the transformation of the country as it enters the war and builds its armed forces which saw over one million men and women enlist into its ranks. Canada declares war on Germany on September 10th, 1939 – In a simulated Canadian living room, the speeches of various protagonists announce the entry into war. The voices of Hitler, Daladier, Chamberlain and Mackenzie King can all be heard on period radios. Civilians and Soldiers: Canadians on Every Front – This area shows that the entire country was mobilized during the Second World War. 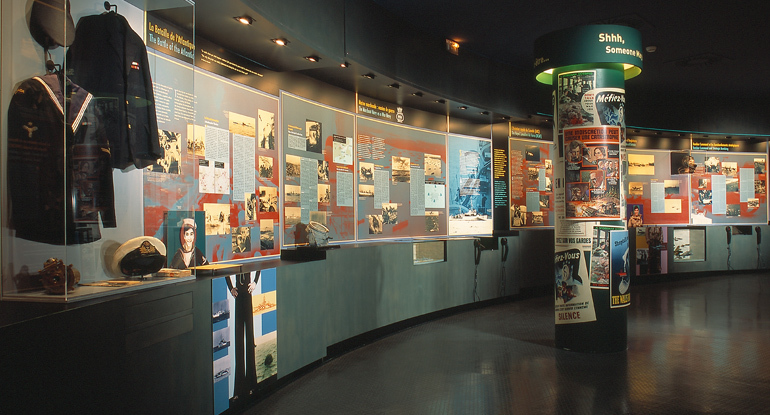 On both sides of a long curved corridor, visitors learn about the different aspects of this mobilization. On the left: joining up, military training, the role of the Canadian infantry, navy and aviation, as well as, the raids at Hong Kong and Dieppe. On the right: civilian commitment and the question of conscription, the British Commonwealth Air Training Plan, the war effort, daily life in Canada, financing the war, etc. The visit continues with a presentation of the different campaigns in which Canadians fought, each contributing to the final outcome of the war: the Battle of Italy, Normandy, the Scheldt, Rhineland and Victory. This room also showcases some of the other military branches that played vital roles in the final outcome such as: the medical corps, war correspondents, engineers, etc. Finally this room presents different themes such as: the Canadians on D-Day, the First Nations at War in Europe, the Canadian Flag, the 1st Canadian Parachute Battalion and Canadians behind Enemy Lines. The evocative title of this room marks the human toll of Canada’s war, while at the same time introduces hope for a better future. Many Canadian families lost loved ones: over 45,000 Canadians died in their fight for freedom. Their names scroll across the ceiling to be remembered. On the other hand, large numbers of Canadians returned home to resume their lives and actively participate in developing contemporary Canada. 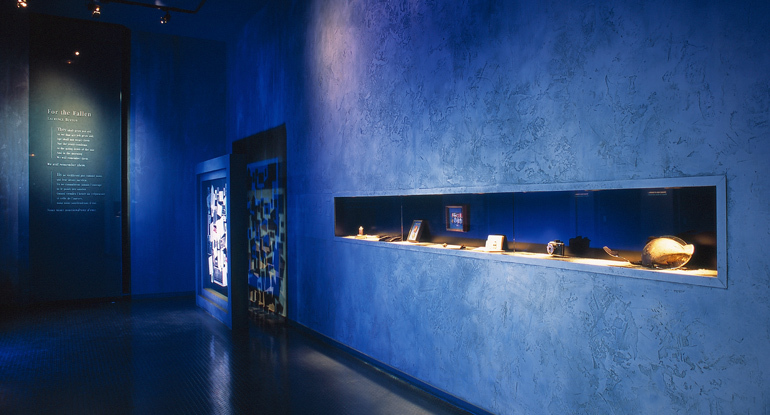 In this room, four alcoves line the wall and give visitors another perspective of the war. They can listen to period letters or essays written by Canadians in either English or French. It is in this room that the young public encounters the two young virtual guides Peter & Madeleine for the last time. 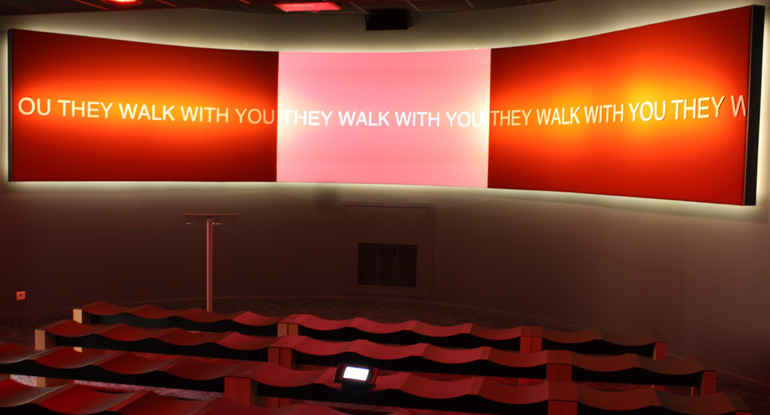 The film entitled “They Walk With You” is an immersive experience using powerful video and emotionally engaging audio, including the voices of the Canadian war correspondents Marcel Ouimet and Matthew Halton. The film utilizes Second World War newsreel footage from a variety of sources and, along with dramatic recreations, re-enacts the role and sacrifice of Canadian infantry soldiers during D-Day and the Battle of Normandy. Viewer discretion is advised. An infantry soldier in war is often not privy to the “big picture”; his job is to fight and try to survive. 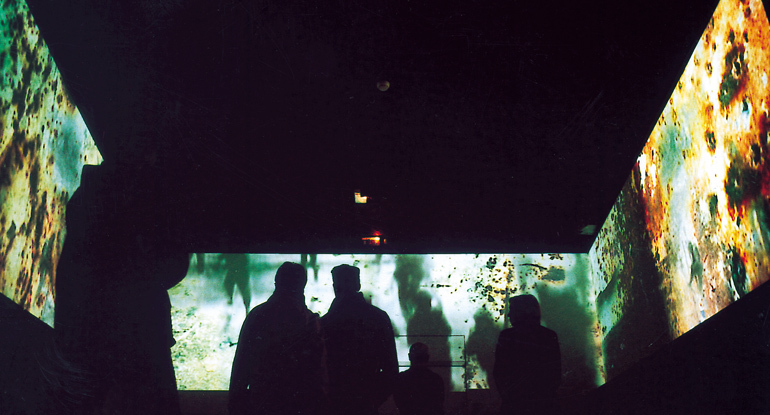 “They Walk With You” immerses visitors in an infantry soldier’s experience.